Ze Frank is the creator and... host(?) of zefrank.com, a remarkable collection of toys, ideas and vlogs. His year-long video blog project, The Show, is widely considered the pinnacle of the form. In the show, he urged listeners to dress their vacuum cleaners in people clothes, to make a sandwich out of the earth by placing slices of bread at opposite sids of the globe, and much more. Folks who listen to Jordan, Jesse Go! already know about Grad School Music superstar Ashkon and his international mega-hit Hot Tubbin'. But what about Richie Cunning? Richie's a San Francisco native -- he was Richard when he was my classmate in high school -- and he's repping hard these days, with a new track called The City that shouts out the N Judah and whatnot. But if you're wondering if this dude can really spit, check out these tracks recorded live on KPFA's legendary hip-hop radio show The Drum with Kevvy Kev. The Drum's in its THIRTIETH year of broadcasting hip-hop to the Yay Area late Friday nights. Richie destroys two freestyles here. It's really difficult to get closer to my heart than by alluding to both Common's first album and 1989 National League MVP Kevin Mitchell in one song. "Lemme read off the trivia card / who the ill cat still rappin' gritty & hard? / Go 'head, take a min... give up? Here's a hint: Rich C, OG from the City of Fog / Dog, I was solo smashin back when Wild 104 was 107 / Back when Jerry and Joe were Bay Area legends / Back when left field wasn't Barry, it was Kevin"
Everyone loves Christmas. Except Oscar the Grouch. But everyone else. Davey Rothbart from Found magazine tells us about a very special holiday budget. Patton Oswalt reveals a demonic holiday memory. John Waters explains the contents of his Christmas album, and author Chris Moore talks about his book The Stupidest Angel. Hello people. So. We have chosen the three winners of the Morris Day VS. A Wild Animal contest. Here they are in no particular order. Thanks to all who entered! Jenny Whiting: Just look at this image. 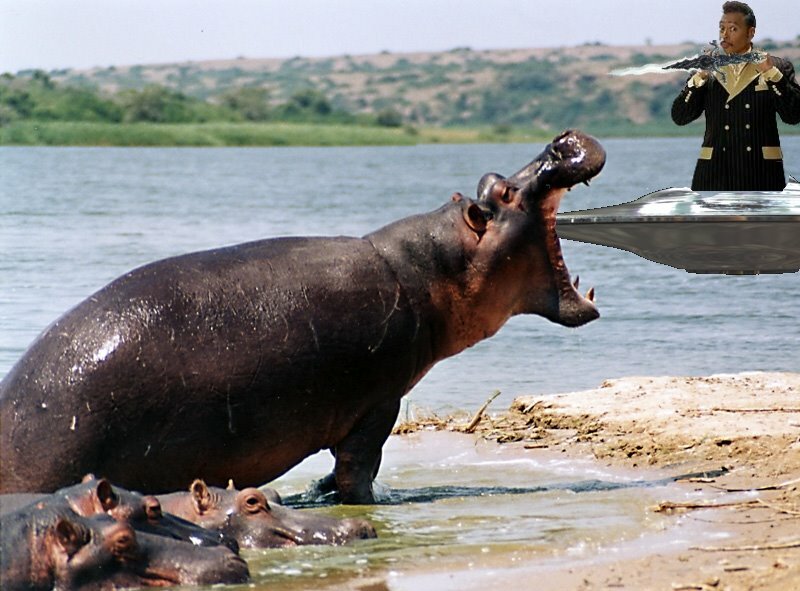 I know hippos are vicious, but eating a U.F.O.? Damn, that's cold. You've got skills Jenny. Skills. Chris Vendrick: Morris Day strangling and kicking a bear in the knee. Do you see fear on his face? I don't. If you like this illustration Chris has a blog. Nice work Chris. 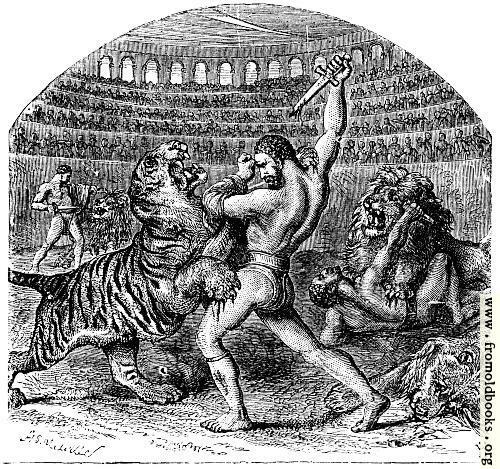 Ian Thompson: It looks as though this lion has interrupted Morris Day walking like an Egyptian through the park. You know what you get for that Mr. Lion? A finger in the eye. Excellent MS paint skills Ian. Thanks again everyone. You're a talented bunch. As MaxFunster PlumberDuck correctly identified in the "cartoons" thread, Duck Amuck is one of the greatest things ever in the history of anything. "Thanks for the sour persimmons, cousin." Jesse and Jordan discuss some tales of shame, the donk ban, movies and more. Now is the time for a contest! What's that you say? Haven't been exercising that creative muscle lately? Or, you've been exercising it so much you wonder why you've been doing it? Well listen up all you creative types! We here at TSOYA headquarters have a solution. 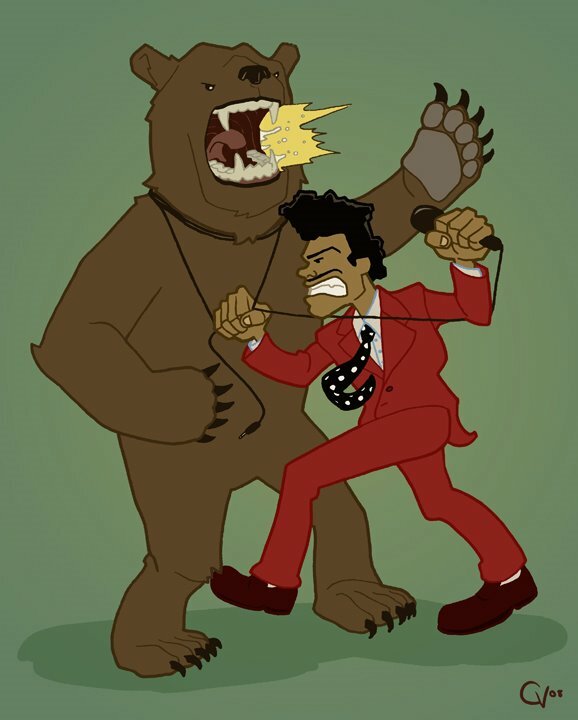 We've always wondered what it would look like if Morris Day of Morris Day and The Time were to battle one of the wild animals of the animal kingdom. Why Morris Day, you ask? Keep reading. So to satisfy us all, we are asking you (the creative ones) to use any media that is transmittable via email to put our curious minds at ease. MS paint is encouraged. No snail mail entries please. be a quarterly but have only published 6 issues since 2001". If you think that's funny, there's more where that came from, so please pay a visit to the site. This is my all-time favorite song.